“Half a sheet at most!” echoed Davies. “This book is not a casual read,” I thought, as I waited for my tire to be repaired. A gargantuan TV, three feet away from me, was blaring the Country Music Awards; I was mouth-breathing, an inefficacious strategy to ignore the overwhelming smell of rubber, and reading three times a paragraph on coded message, attempting to comprehend it. After failed attempts at deciphering acronyms, I made my own code on the inside cover with their meanings. 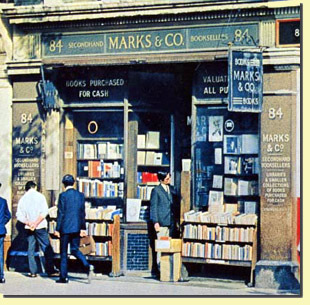 Knowing the author, Leo Marks, was the son of the owner of the bookshop made famous in Helene Hanff’s 84, Charing Cross Road was a big draw to this book. There are many references to the bookshop; it would be helpful, but not essential to have read it first. Although Hanff’s story is set after the war, knowing it provides a fun context. At twenty Marks begins fighting the Fuhrer with his cryptography skills. He trained agents headed for enemy territory to send and receive messages in a code based on a famous poem the agent had memorized. The problem with poem-codes is that the enemy cryptographers could break the code if they figured out which poem was used. If an agent was captured, he or she would swallow cyanide to keep from telling secrets under torture. The enemy would often continue sending and receiving messages, concealing the knowledge of the capture. Even as an understudy, Marks understands the the system’s vulnerability. He begins writing original poems for use, a few of which have become famous. Over time he threads together a remarkable innovation to use a one-time, disposable code printed on silk, easily burned after use. This book is the story of his failure and success to spin his silk idea to his superiors. Marks’ agility with language delights. → As a boy he studied the mating habits of the alphabet. → A superior officer had a knack for switching on silence as if it were air conditioning. → He writes about a desk so small, it was like keeping vigil on a splinter. → Could we have a quick word? He was a verbal weight-watcher. Marks relates the story of his intelligence with self-deprecating jabs. The need to justify and its sister frailty, the need to boast, were lethal weaknesses in SOE, and the shock discovery that I was prone to both started me worrying about the coders of Grendon. While his acute concern and the initiatives he made to protect the safety of the agents shows remarkable maturity for a young twenty to twenty-three year man, the bawdiness that occasionally pops up reminds the reader that he was indeed still close to adolescence. On Christmas Eve, 1943, Leo Marks got word that his girlfriend Ruth had been killed in a plane crash in Canada. He wrote this short poem, which he later gave to an agent Violet Szabo. Wikipedia tells me this poem was read at Chelsea Clinton’s wedding. Is your and yours and yours. This entry was posted in book review, Books, Poetry, Words and tagged 84 charing cross, code war, cryptography, england, leo marks, poetry, silk, the life that i have, ww2 by alivingpencil. Bookmark the permalink. Thanks for the recommendation, Angie. Some are raunchy, but here is another one about being buried next to your spouse. But we shall get used to it in time. Of which we’ll have plenty. In which we said everything. Thoughout the longest silence of all. Wow. I really want to find and devour this book now. I hope you can find a copy.